Reach travelers wherever they're going, in over 13,000 destinations worldwide. If you have questions, call us at (877) 833-1555 (ask for Matt) or . Targeted travel advertising that's effective and affordable. The fastest way to get started is to call us at (877) 833-1555 (ask for Matt) or , and we'll help you choose your market(s), ad size(s), and schedule placement dates. Skipjump advertisers are travel-related service providers. We offer locally-targeted advertising for: car rentals, charter flights, ferries, spas, restaurants, retail, skiing/golf areas, theme parks, cultural attractions, etc. All Skipjump ads compliment, rather than compete with, our inventory of accommodations offerings. Put your company's message in front of travelers visiting your location. Skipjump's hyperlocal targeting capabilities deliver a tailored campaign across all our 13,000 desintations. A few examples that showcase our ability to deliver a tastefully branded and highly-targeted campaign across any of our 13,000+ destinations. With more than 13,000 locations worldwide, whatever travel-related service you have to sell, wherever you are, there's a place for you on Skipjump. Your campaign will be priced according to your market selection. Being specific will lower your monthly rate: for example, campaigns broadly targeting the Caribbean are priced higher than a campaign targeting just the U.S. Virgin Islands. The narrower the campaign, the less expensive. We offer standard display ad sizes throughout our site. We can help customize an ad to fit any of our many available sizes. If you need creative assistance with your ads, we can also help. Schedule your ad to reserve placement. You may want to run your ad only during tourist season, holiday months, or year round: you decide. Once your ad is scheduled, it will appear across your targeted desintations. Skipjump's popularity with savvy, in-market travelers assures ready-to-buy traffic other travel websites only dream of. With our sophisticated targeting technology, we guarantee your message reaches interested travelers their destinations and interests. 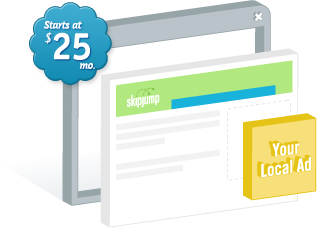 The Skipjump advantage is simple: travelers who see your ads are poised to purchase, not casual shoppers. Skipjump offers a one-stop shopping experience for customers who plan their trip online. To get started on your campaign, or call us at (877) 833-1555. Choose from an international list of travel markets: over 13,000 destinations on the Skipjump platform. Pay a flat monthly fee: no contracts, ever. Plans start at $25/month, depending on placement. I received a couples massage booking within the first three weeks of placing my ad on Skipjump.com. The client came back during her stay for a facial, too. The whole process was very simple and obviously effective. We now receive direct calls by customers planning advance tours since we started advertising on Skipjump. Now we can market directly to customers rather than relying on referrals. Call us at (877) 833-1555, or .